Lincoln Meadows has collaborated with CMEC to provide a high presence clinical model. 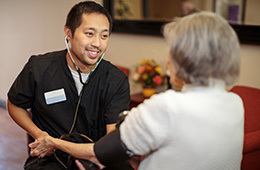 We have a Nurse Practitioner and Physicians Assistant at the facility 40 hours a week, Monday through Friday. She works closely with our Medical Director to attend to clinical needs more efficiently. Initially, the MD will visit within 72 hours and regulations require every 30 days thereafter. Our model allows much more interaction than the minimum standard. We do have a smoking area, but each resident must have a smoking assessment to ensure his / her safety to smoke. Social Services will meet with the resident to assess this interest and ability at admission. Consistent with the provision of special diets, always consult with the nursing staff before bringing food to residents. Any food kept in the resident’s room must be in properly sealed containers, but cannot be left overnight. All food brought in must be consumed and will not be able to be stored or refrigerator due to infection control policies and procedures. All of the rooms currently feature free cable television. Some of our rooms have shared TV’s. We are remodeling our rooms in 2017 so each resident will have their own TV. All of the rooms currently feature a telephone hookup. We are overhauling our phone systems to allow for personal phones at each bed with individual extensions.